We’ve got the perfect way to kick your holiday party up a notch. Invite your guests to sing along to everyone’s favorite songs and carols by grabbing your TDS TV® remote. Yes, we said your remote. This holiday season, Stingray music is offering Holiday Party karaoke On Demand—for free. You can queue up everything from yuletide classics to contemporary holiday hits. But there’s lots, lots (and lots) more. Seriously, there’s something for everyone, from grandma to the little ones. 1. Go to Menu and then to On Demand. 2. Use your arrow button to head down to the Extras menu and then to Music. 3. 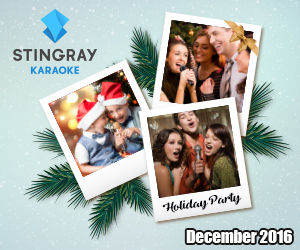 After you pick Music, choose Stingray Karaoke and then you can select Holiday Party. 4. Select what you’d like to sing and use the arrow keys to select Play. If you’d like more in the same category, head to the top menu and select More Like This. 5. Fun seasonal beverages for grownups and kids. 6. Dress-up props (feather boas? Always in style!). 8. A Snapchat filter to make photos extra fun for your event.